I lampshade and I'm proud. Being comfortable is SO important, especially for class. As stereotypical as it is, an oversized t-shirt, no makeup, and a messy bun is as comfortable as it gets, and if I'm taking Econ notes (*crying) at 8:30 am, there is no way I'm passing up on an opportunity to ease the pain. I send my regards to any of my fellow classmates who had to experience the wrath of my lampshading, but it was a necessity to surviving class. Girl: "what are you guys going to wear?" Other girl: "T-shirt and Nikes"
Moral of the story: Going to the movies? Going to class? Hanging out with friends? Lampshade that sh*t.
Why spend money on clothes when you could spend it on food and impractical things you do not need?... or paying bills... if your into that. It cost $0 to get an old, oversized t-shirt from your dad, brother, boyfriend etc. Why waste time getting ready when you could be sleeping? Just throw on that giant potato sack you call a shirt and some basic Nike shorts, and you're ready to go. 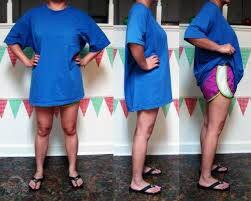 Because of the abundance of space provided by the men's XL t-shirt that you probably took from a frat boy named Chad, you can easily fit both arms and legs into the shirt whenever you are cold, creating a turtle-like motion. Because the shirt is covering up most/all of your shorts some people maybe wondering: Are you wearing any shorts? Are you wearing the same shorts that you have been for the past three days? Are those shorts hot pink and from the 6th grade? The world may never know. Thanks to the lampshade trend, it is very difficult to know a girl's true figure. For all they know, I have the same body shape as Spongebob: just a giant square with some legs. From being balled up into your dresser drawer to being used as a giant napkin, these faithful beauts seem to always survive, yet again proving lampshading is the way to go.